The Lumière Gala has become one of the bright lights on Ottawa’s gala scene, and not just because it features its very own personal fireworks show. 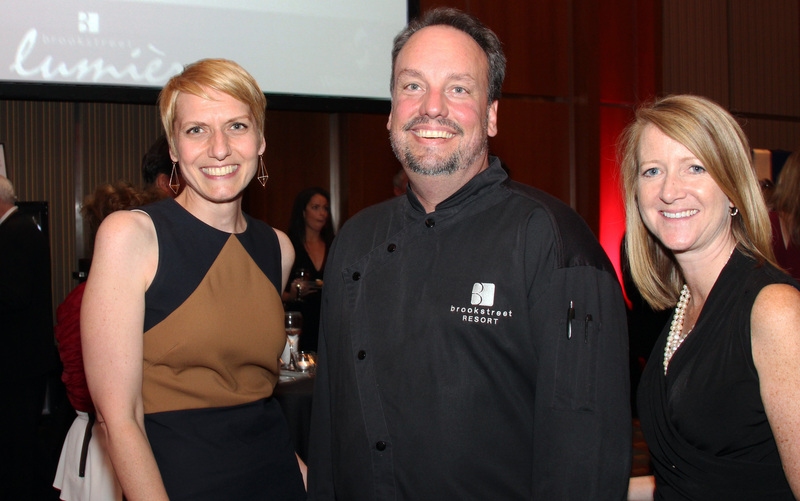 What began in 2003 as a grand opening hotel celebration has evolved into an annual gala that’s cumulatively raised more than a million dollars for local charities. A sold-out crowd of 650-plus partygoers attended this year’s $150-a-ticket gala, held Thursday at the west-end Brookstreet Hotel in Kanata. “This year is going to be bloody good because it’s the biggest one we’ve ever held,” hotel owner and Ottawa-made tech titan Terry Matthews said while speaking at a VIP reception held exclusively for major sponsors. And he was right; the gala set a new fundraising record by bringing in an estimated $115,000 for the Ottawa Regional Cancer Foundation (that doesn’t include proceeds from the Keltic Cup fundraising tournament held that day at the hotel’s golf club, The Marshes). The Brookstreet has been partnering up with the philanthropic arm of Matthews’ Wesley Clover International to host the popular evening. This year’s Canada 150-theme offered guests A Taste of Canada from every province and territory, along with an assortment of wines and beer. Bay of Fundy lobster, shrimp and scallops; Alberta beef brisket; mussels, salted cod and crab beignet; buffalo steak and kidney pie; smoked pork belly; and maple sugar pie were among the culinary choices. The Cambridge Bay Arctic char from Nunavut was the favourite of Nyle Kelly, the newly promoted general manager of the Brookstreet Hotel. He took over from Patrice Basille, who retired from his long-held position but continues to work for Matthews. Basille missed the gala because he was away in Orléans (as in France and not the other end of town). For many business professionals and entrepreneurs, Lumière is a night of mingling in a fun and relaxed atmosphere. It’s not easy, however, to get everyone to quiet down. Just ask Ottawa Regional Cancer Foundation president and CEO Linda Eagen. She used a cowbell to hush the room before making her brief remarks about the promising cancer-fighting clinical trials happening in Ottawa. Loyal attendees of the gala include Ottawa entrepreneur Bruce Linton, chairman and CEO of Canopy Growth Corp. “The best part (of the evening) is the networking, and meeting those people that you want to see all year long, but you get so busy working that you don’t get to,” he explained. Jeff Johnson, a partner at sponsor Deloitte, also uses the evening to catch up with clients and contacts. “It’s the best couple of hours you can probably spend in a year,” he told OBJ.social. Still, it was worth taking a social time-out to soak in the live Cuban jazz music, performed by jazz pianist Miguel De Armas and his musical guests. Cancer survivor and local celebrity ‘Stuntman Stu’ Schwartz commanded the stage during the live action. He sold such enviable items as a 100-level suite to a Senators vs. Canadiens game, a six-course chef’s table for 10 at the hotel’s Perspectives Restaurants, and a one-week stay in a large luxury villa in the Grand Cayman that fetched a lofty price of $17,000 from Faces Magazine owner Justin MacKinnon. The always-popular golf break for four at Matthews’ The Celtic Manor in Wales, with limousine shuttle to and from Heathrow Airport, was back on the auction block. The trip has been bought a bunch of times in past years by Kent Browne, owner of sponsor Royal LePage Team Realty. Unfortunately, he was sick this year and couldn't attend. Not a problem, though. His wife, Mary, and daughter, Abby, were there. Abby consulted with her father, via cell phone, throughout a tense bidding war and won the trip for $5,000.